UPDATE: On March 28, the government released a revised report on GDP growth in 2018. According to the new estimate, real GDP increased 3.0 percent from Q4 2017 to Q4 2018. Comparing Q4 2017 to Q4 2018 – a common measure of economic growth for the calendar year – real GDP grew 3.1 percent, the highest rate since 2005. Using an annual average, real GDP reached 2.9 percent in 2018, tied for the best rate in more than a decade. It reported that GDP grew 3.1 percent in 2018 on a Q4-to-Q4 basis. 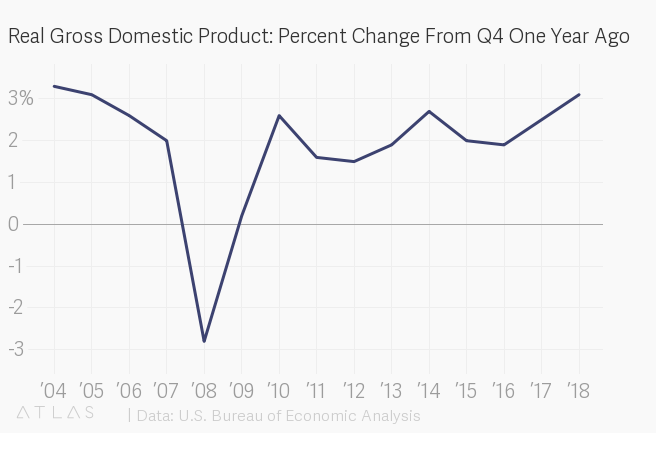 “In 2018 (2017:Q4 to 2018:Q4), the U.S. economy grew at a rapid rate of 3.1 percent, the fastest pace for any calendar year since 2005,” reads the blog post. Trump has taken to repeating this statistic, both over Twitter and during public remarks. The 3.1 percent figure comes directly from the BEA, which measures real GDP growth for the year in two ways – the percent change Q4 to Q4 (growth during the year) or the change in annual averages (growth from one year to another). It reported the findings on Feb. 28 and will issue revised estimates Thursday. If the Q4 figure is revised downward, as some experts suspect, the calculus below may change. Nonetheless, the claim was correct at the time of Trump’s tweet. On a Q4-to-Q4 basis, the economy last broke 3 percent in 2005, reaching 3.1 percent, according to data tables from the BEA. The year before that, it reached 3.3 percent. Patrick Newton, press secretary at the Committee for a Responsible Federal Budget, said that the Q4-to-Q4 change in GDP was a reasonable way to calculate economic growth for a given calendar year. While the White House has focused on the calendar year, Newton pointed out that the same 12-month analysis can be done for other quarters as well. When calculated using annual averages, the economy grew 2.9 percent, according to the BEA, matching the growth rates last seen in 2006 and 2015.